Several friends and acquaintances of mine have recently been diagnosed with terminal illness. I feel such sadness and heaviness in my heart for them – but I never know the right words to say. I think back to the time when my dad had terminal pancreatic cancer. He was dying and we all knew it. I tried to remember what it was like to be on the other side of the situation – as a family member. I don’t remember a lot of what people said – but I remember more of what people did. It was the same thing when my mom passed. People shared of themselves – they shared light and love when I was a mess. Everyone was kind and encouraging to me – but a few people actually DID things and I remember that. When my daddy died, a sweet lady in our church not only sent flowers, she included a little ceramic pumpkin for me to keep after the flowers died. I let her know I thought that was real nice of her. When my mama passed, even though there were not that many people coming to our house, our pastoral family went above and beyond the call of duty to provide sandwich stuff! Oh my we did not go hungry! I remember my sister-in-law and brother-in-law washing dishes and thinking that was so kind of them. When families suffer loss and are at their lowest, isn’t that when Christian folk can shine the light of Christ in their lives in a very real sense? Words are fine, but actions are better and make more of an impact on their lives. After a loss, everything is fuzzy when you’re trying to listen to kind words. Most of the talk just flies over your head. You hear what people are saying, but you’re just so grief-stricken, you can’t process what’s being said. So – how do you avoid hell and make Heaven your eternal home? Open the closet door where you keep the secrets and sins. It’s not easy to show God what is inside your closet. Think about this though – He already knows about it, so… who do you really think you’re foolin’? We are so human – but the good news is… He is so GOD! If you ask God, through His Son, Christ Jesus, to forgive you of your sins – He is faithful and just to do it. Trust Him for the rest of your days – and for the time when this life is over. We’re mourning a loss in our family. Our precious fur baby passed away on the 22nd of January and our lives are so different without him. He had diabetes and cancer that was very aggressive. He was 91 years old in people years, and had a wonderful long life with us. The 13 years he was with us were the happiest of our lives – that’s for sure. I hate disease… just flat hate it! Dear Jesus, Divine Physician, Healer of the Sick. Who are suffering from cancer. We entrust them to Your loving care. They are Your children and they are in pain. that You are with them in this difficult time. Give them strength and healing. and let them rest securely in Your arms. Help those who care for them. Give insight to researchers that they may discover cures. they will care for them with grace and love. to be with them and help them bear their burdens. witnessing to Your healing love. For you are blessed, for ever and ever. 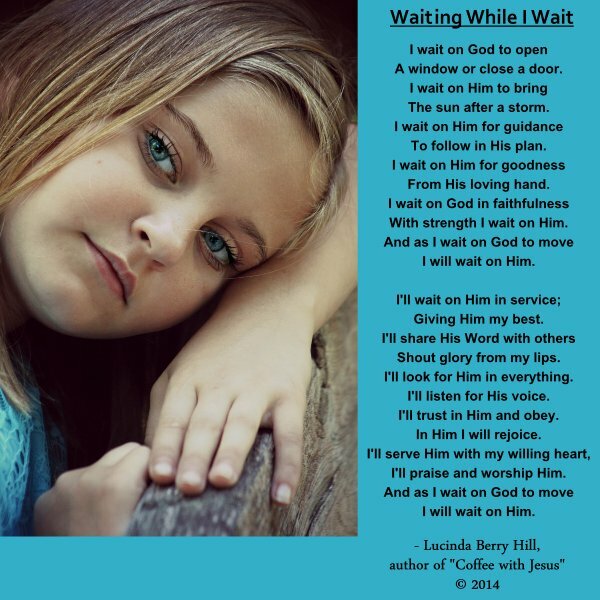 I received a sweet poem from Lucinda Berry Hill and it brings me comfort – thinking of God’s heaven and eternal life always brings me comfort. Thank you, my sweet friend! We don’t have children, therefore, we don’t have grandchildren. I like to think that Casey is in heaven playing with all the little children there! If you’ve read the book, “Heaven is For Real” or seen the movie, you know that little Colton saw his family in heaven – but they were young, not old. All the residents there are free of pain and the burdens of this world. It’s selfish to want them back here, isn’t it? Are you a griever? Do you know another griever? Maybe part of preparing your heart and mind for the birthday of Christ should include a conversation with another griever. It really does take one to know one, and we feel so much better if we can share a Christmas memory. Some memories make us laugh, others make us cry – but they are all so very precious and we hold them close – especially during the Advent season. I’m fortunate to have many friends who are grieving the loss of loved ones. I’m even more blessed to have the freedom to talk about the loved ones I miss this year. More importantly, however, I try to be a good listener as well – and let them talk about their loved ones. Sometimes we tell the same stories over again, but that’s okay. By repeating those tales, we keep them alive in our hearts and minds. It took me a long time to come to terms with this, but even though my loved ones have gone to heaven, it is still the same Spirit that watches over us. Of course, they know God in all His beauty and splendor now – and I still see as through a glass dimly… but the day will come when we will both be in His presence. That is the hope we hang our hat on, isn’t it? There is such a hole in my heart! Today should be a day of joy, but I feel only the emptiness and loss of someone so beloved. While the world celebrates around me, I remember Christmas celebrations of the past and I long to have my loved one with me. I bring my sorrows to you, Lord, like some odd gift of the magi and dump them at your feet. In my blind tears I wonder if anyone can possibly understand the depth of my sadness. Yes, you can. You sent your son to be with us in our deepest sorrows and I know that even though I might not feel it at this minute, you are here with me, grieving with me, caring for me in my sadness and loving me. Dearest lord, help me to turn to the one I miss so much today and speak. Help me heal the loss of our parting and help me not to regret the things I didn’t say. Sorrow tears at my heart, but today I ask that my loss soften my heart and make me more compassionate with everyone I meet. Here’s the deal… about the time I’ve reached acceptance and think, “I’m gonna be okay”, something happens and I’m suffering a setback of sorts. Maybe this is God’s way of keeping me humble. It may not help that I’m still living in the city I grew up in, but I really can’t imagine living anywhere else. If I were to leave Wichita, I think I’d feel like a fish out of water for a very long while. Yesterday I was driving to the Walmart and had a little time to kill. I decided to drive by my childhood home. As I slowly crept down Charles Street, so many memories came to mind, starting with the street itself. I remembered a dirt road. For the first three or four years of my life, our street was dirt. Then I noticed that the barbed wire fence around our neighbor’s field was gone. John had 3 horses in there for years. We had an apple tree in the back yard, so the horses got to eat apples once in a while. I enjoyed feeding them! Mom and dad had a non-fruit bearing, flowering crab apple tree in the front yard – only it DID bear fruit – and boy was it a mess; however, along with the messy crab apples were the most beautiful dark pink flowers! I remember my mom in the yard with a rake picking up the crab apples every year. The raking would begin around late August or early September. I guess that struck a chord inside. Then I lost it – I just lost it – again! When does that stop happening??? The floodgates opened over a memory about crab apples??? Seriously??? The answer from God seems to be, “Bloom where you’re planted”. So, here I am! The other day I was at an antique store and spotted some very pretty quilts! I’m in awe of those who cut material and then sew it back together – of course, it’s a bit more complicated than that. When I see quilts, my mind goes back in time – to my Granny LaVella. She was such a sweet soul. I know heaven is a wonderful place because she is there – and she may be making quilts! I remember seeing granny at her Singer sewing machine – one that was very ornate and set on a sturdy and fancy wrought iron stand. She always had scraps to make a quilt for somebody. Her ministry was to keep everyone warm! Even though she left us so long ago, when I see beautiful quilts I can’t help but go back in time and think about her. Her quilts were a labor of love and she personalized each and every one by using the recipient’s favorite colors or if possible, she would use some of their old clothing for the quilt scraps! I never learned to quilt and certainly did not gain that knowledge through osmosis… but I sure do admire and respect the art. Quilts are so beautiful and a reflection of their maker. By the same token, my Granny LaVella was so beautiful and a reflection of her Maker. Thank You, God, that she was my granny!